I wrote this story at a time when our country was deeply divided. There has been a lot of anger and anger breeds entrenchment and the certainty that one point of view is the only way to go. Under those circumstances (and believe me, I have been as guilty as anyone), we stop listening and respecting and seeking common ground. As a person who believes in the basic decency and goodness of most people, I am an optimist, and as a writer, I tend to hang around with characters who do not give up when it would be really easy to do so. Nell could take her son and move away while Trey’s cattle ranch will survive no matter what so he has little call to get mired down in the fight between his neighbors. And yet, they stay and they join forces, and they come up with solutions. And I love them for that—so I let them win!! Just wish it were that easy in real life! I hope you enjoy Last Chance Cowboys: The Rancher, and mostly, I hope you will be in touch to let me know your thoughts. 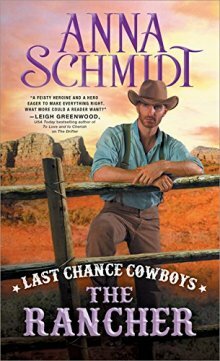 Anna Schmidt is a three-time finalist for the coveted RITA award presented annually by Romance Writers of America. In addition she has been a four-time finalist for the Reviewer’s Choice Award from Romantic Times magazine—an award she has won twice. Her latest novel THE OUTLAW (Book Three of her Last Chance Cowboys series) will be published in July. Book four—THE RANCHER –will be out in January, 2018. Publisher's Weekly had high praise for Anna's WWII series--THE PEACEMAKERS--stating that "Schmidt seamlessly integrates...actual events, and the courageous real-life individuals who fought against Hitler’s regime, with her fictional characters and their story, to produce a strong tale of hope and love in the face of insurmountable obstacles." Our lucky winner is... Yaritza Santana! I can't wait to see how this book plays out! The Rancher sounds like a good read. Thanks for the chance. Sounds like a book that I will enjoy reading!! On Mar 24, 2018, landfjacobson said: Cant Wait! Oh this sounds so good, I cannot wait to read this one! Would love to read this book! Sounds good! Thank you! Sounds like an interesting and enjoyable read. Thank you for the excerpt. Will have to read the other books in the series as well. Sounds like a wonderful read and a real book too! Love the cover! Thanks for the chance! love the blurb and cover! This looks like a heartwarming story! I have seen in my own family the division caused by the political turmoil. Even now we are careful about what is brought up because no one can seem to have a mature conversation without building up to a vicious argument.